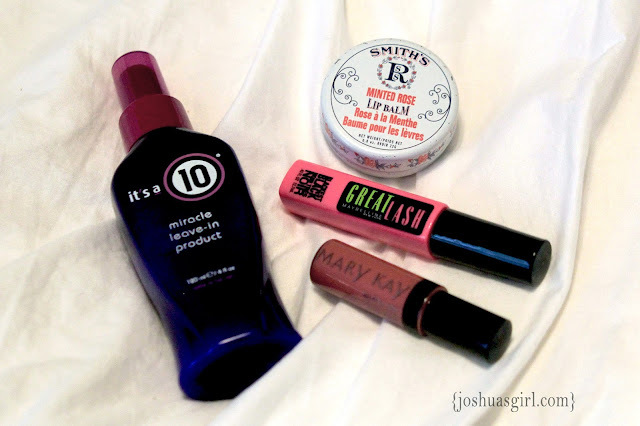 Joshua's Girl: SUYL: Favorite Beauty Products! Today, at Show Us Your Life they are discussing favorite beauty products. I may not be an expert in this area, but I do love me so good products!!! ;-) Now that I have two girls under the age of two, my beauty routine is limited. I've also learned that investing in high quality products that actuall work pays off in the long run!! It's A 10: This product is the latest, and greatest item in my bathroom. After two pregnancies, I noticed that my hair felt very dry, and dull. I was also dealing with tangles for the first time in my life. I did some researching, and heard nothing but great things about it's a 10!! And wow...does it live up to the hype! I bought my bottle for $20, and it was worth every single penny. It makes my hair super soft, and shiny!! And, it helps with the crazy tangles. Great Lash: It's probably the oldest, most loved mascara on the market. I've used it off and on throughout the years, but given that I'm a mascara addict, I'm constantly trying new ones from the drug store. And yet, after my last splurge, this was the bottle I wanted. It's the perfect black color, the formula is smooth, and I just love it. Classic, and timeless. And you can't beat less than $5 a pop! Smith's Rose Lip Balm: Believe it or not, my husband bought this for me one year at Christmas. It is hands down the BEST lip balm on the planet. I have super dry lips. It has done wonders for me, especially during the winter time. Mary Kay Lip Gloss: It's one of the few lip glosses that I will wear. It's not sticky, and it smells good. Plus, I love their color options!! So, what are your favorite beauty products? I have tried lots of Mary Kay stuff but not the lip gloss. I've always thought it was sticky and gooey. Thanks for the review. I will have to give it a try! Also LOVE It's a 10. I'm going to have to try that lip balm. Thanks for sharing! It's a 10 is awesome! Stopping over from the linkup. Hope you can hop by my blog as well. Have an awesome weekend! My "beauty" routine is super simple, but I can't survive without Burt's Bees lip balm. ;) I'm now very curious about Smith's Rose, though!